Going to Malaysia by train from Singapore is a very viable option. It's convenient, comfortable, fast, safe, as well as cheap. And it's fun too, because some of the Malaysian tracks still run through remote patches of jungle and other beautiful scenery, just as they did during the old days. This makes traveling through Malaysia by train still feel a bit like traveling in colonial times. Sure, the trains have been spruced up a fair bit since then, but you'll still find it quite easy to imagine what it was like back then. The main rail service operator in Malaysia is called KTM Berhad, commonly known as KTM. 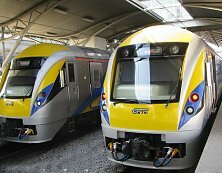 The KTM Intercity train service covers some of the most popular routes, including Singapore to Kuala Lumpur Sentral, in Malaysia. There are different classes of tickets, from 2nd Class Seat, to 2nd Class Sleeper, to 1st Class Deluxe Sleeper. Now these Deluxe Sleepers are indeed Deluxe, as they offer quite a few bells and whistles. Deluxe Sleepers come with full air-con, a private cabin, including a bed and a private shower/toilet too. Deluxe Sleepers even have an LCD TV! Talk about traveling in style. Best of all, the rhythmic clackety-clack and gentle swaying of the cabin will have you sleeping more soundly than ever. The full train trip to Kuala Lumpur is 6.5 hours, give or take. Meals are available and, unlike much-maligned airplane food, the dishes offered on this train, mostly local fare, are a real treat. The train to Malaysia departs from the Woodlands Train Checkpoint, located in the north of Singapore, just south of the Causeway. You can make your way here from pretty much anywhere in Singapore by MRT, bus or taxi. By the way, for your information, immigration formalities for both countries, Singapore and Malaysia are done before boarding the train. Incidentally, it's important to note that you need a prior reservation to actually get on the train. That is, you're not permitted to just hop on without a valid ticket. All in all, taking the train from Singapore to Malaysia is a cool experience and quite recommendable. Besides, where else can you find a decent sleeping place combined with A-to-B transport so cheaply?